It’s been a trying week for Queanbeyan trainer Todd Blowes but in the end his exciting prospect Noble Boy proved he is the real deal with a dynamic win in the $500,000 Newhaven Park Country Championships Final (1400m) at Royal Randwick. 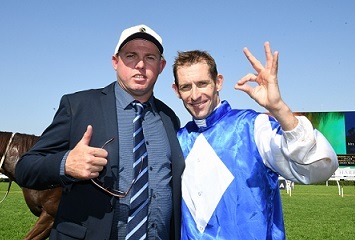 Todd Blowes and Hugh Bowman celebrate winning the Country Championships with Noble Boy (Pic: Steve Hart). And while the previous few days, after Noble Boy didn’t please Blowes with his trackwork, have tested the rookie trainer there was still more drama as the four-year-old threw a shoe and had to be re-plated behind the stalls. Amazingly, Noble Boy was just Blowes’ 17th starter in a race and the world is his oyster. “There was a concern when I pulled up after his gallop, it was just different work to his normal sort of stuff, but he’s only a lightly raced horse and I’m still learning things about him,” Blowes said. “For once I wasn’t worried (when he had to be replated). Throwing the shoe there before the race wasn’t ideal but I was pretty happy with the horse, the way he stood there, and Hughie just pushed all the right buttons and it opened up. Noble Boy, whose only defeat came in the Goulburn Qualifier on March 2, had to wait until the wild card at Muswellbrook to book his spot. Aided by a cool ride from champion jockey Hugh Bowman, Noble Boy settled midfield and worked through the pack proving far too good for Port Macquarie Qualifier winner Lucciola Belle scoring by 1-3/4 lengths with Albury Qualifier winner Bennelong Dancer in third. “Looking back now it might have been a blessing having two weeks from the wild card up to today,’’ Blowes said. Dunedoo raised Bowman, who also rode Noble Boy to a Warwick Farm Highway win and the Muswellbrook Wild Card, suggested the horse still had plenty more to give despite streaking away late. What lies ahead for the gelding, who has now win six of his seven starts, remains to be seen. The Country Championships has already produced a Group 1 winner in 2016 champ Clearly Innocent while both inaugural winner Artlee and last year's champ Victorem proved themselves in stakes company. Noble Boy could be the type to be back at The Championships next year as a lightweight Doncaster Mile chance and appears an ideal type to aim at the Villiers in December, a race that offers a free ticket in the autumn feature mile. “If I had something more to chase he could have given more,’’ Bowman said. “He’s a very casual individual, he really enjoyed the conditions here today. He has class this horse. The disappointment of the Country Championships was the late scratching of Goulburn Qualifier winner Al Mah Haha who kicked out in the stalls and failed a vet check.